We’d love your help. Let us know what’s wrong with this preview of Sabrina the Teenage Witch by Tania del Rio. 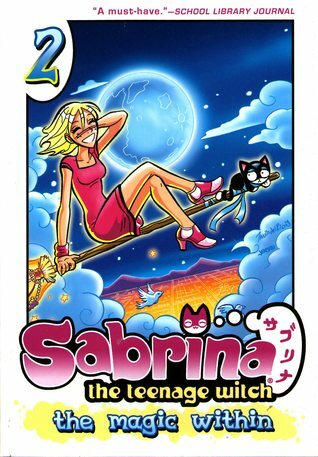 The magic continues in SABRINA THE TEENAGE WITCH: THE MAGIC WITHIN! Sabrina Spellman’s life is intense. On top of the usual stresses of being a teenager, she’s a witch! And that means two schools and twice the work, from her Mortal Realm high school and the Magic Realm’s Charm School. It should be simpler. But in addition to a regular spelling bee, she has to study for a magical spell-ing bee. She’s finally dating her childhood Sweetheart—but he doesn’t know she’s a witch! She also has a crush on a cute young wizard—but he’s dating her best friend! On top of the drama, Sabrina keeps being dragged into the middle of strange and dangerous events in the Magic Realm. To ask other readers questions about Sabrina the Teenage Witch, please sign up. Sabrina tonårshäxan i mangaform. Sabrina kämpar med de vanliga tonårsproblemen samtidigt som hon stöter på magiska problem. Hon bor tillsammans med sina två fastrar och katten Salem (som egentligen är en trollkarl, men som blev förvandlad till katt som straff för att han tänkte ta över världen.) Sabrina går i skolan i den vanliga världen, men också i den magiska. Hon är tillsammans med Harvey, men är samtidigt lite förtjust i Shinji. Dessutom upptäcker hon och hennes bästa vän en hemlighet som s Sabrina tonårshäxan i mangaform. Sabrina kämpar med de vanliga tonårsproblemen samtidigt som hon stöter på magiska problem. Hon bor tillsammans med sina två fastrar och katten Salem (som egentligen är en trollkarl, men som blev förvandlad till katt som straff för att han tänkte ta över världen.) Sabrina går i skolan i den vanliga världen, men också i den magiska. Hon är tillsammans med Harvey, men är samtidigt lite förtjust i Shinji. Dessutom upptäcker hon och hennes bästa vän en hemlighet som skulle kunna förändra allt i den magiska världen och i slutändan även i den vanliga. The romance was just trash, but the overall storyline is somewhat intriguing. I love this series! It’s a lot of fun. It isn’t like the other Sabrina the Teenage Witch comics or shows I’ve watched before. There are a lot of fantasy elements to the story. The magic realm plays an important part in the series. Sabrina and her friend discover that the Mana Tree is dying, which represents the life of their queen. They also travel under the sea to the world of merpeople. I love these fantasy elements of the story. Rather than seeing a witch in the real world, which is what the o I love this series! It’s a lot of fun. It isn’t like the other Sabrina the Teenage Witch comics or shows I’ve watched before. There are a lot of fantasy elements to the story. The magic realm plays an important part in the series. Sabrina and her friend discover that the Mana Tree is dying, which represents the life of their queen. They also travel under the sea to the world of merpeople. I love these fantasy elements of the story. Rather than seeing a witch in the real world, which is what the other series are usually about, we get to see the magical world that Sabrina comes from. One part that I found surprising with this series is Harvey. I can’t stand him in these stories! He can’t make up his mind about liking Sabrina. He likes her, but once they get together, he changes his mind. I was rooting for her and Shinji to get together (even though he is dating her best friend). The romance was boring but the rest of the story was quite interesting. I like the mystery behind the Mana Tree - I want to know what happened and this is why I keep reading - but Sabrina is quite unlikable because she keeps changing her mind. And all the teen drama is too much. The part about the underwater town was the best, in my opinion, but I do have a soft spot for sea creatures. I guess I'll finish the series. It's quite interesting even if, for a manga, it surely does have too much text. R The romance was boring but the rest of the story was quite interesting. I like the mystery behind the Mana Tree - I want to know what happened and this is why I keep reading - but Sabrina is quite unlikable because she keeps changing her mind. And all the teen drama is too much. This volume had a lot of great chapters & plot twists. I loved seeing how all of the characters and their relationships evolved throughout the book as well as getting to know more about them and their pasts, especially Sabrina & Shinji's pasts. This volume also introduced a new character that looks like he will add a lot to the story. Chapter 05.) It's Nic This volume had a lot of great chapters & plot twists. I loved seeing how all of the characters and their relationships evolved throughout the book as well as getting to know more about them and their pasts, especially Sabrina & Shinji's pasts. This volume also introduced a new character that looks like he will add a lot to the story. romantic, magical and mysterious book. The magical second volume in the Sabrina series by Tania del Rio. A wonderful story for manga fans of all ages. I'm still not so sure about the whole love-triangle-as-plot-device trope, but that's just me. Adding political intrigue helps a bit. We're a long way from Riverdale. I enjoyed the introduction of the Four Blades, and I'm still loving the series. I'd like to see more crossover between Sabrina's mortal and magical life. The story does better as it goes on but it needs to decide whether time moves forward or not. If next book starts with them entering tenth grade I might explode.